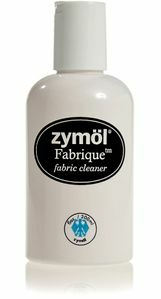 The Zymol Fabrique Cloth Cleaner is formulated to clean and remove stains, oils and dirt from your car, truck, van or SUV's carpet and upholstery and bring back to its original color and texture. You can save money by avoiding having to go to the detailer. You cal get the same cleaning results from detailers with the Zymol Fabrique Cloth Cleaner. The cleaner is also phosphorous-free, solvent-free, carbon dioxide-charged dry-wash fabric cleaner designed to remove foreign matter and oils from seats, carpet and cabriolet tops without disturbing the inherent properties of the material.